Artist-researcher Heidi Fast presents the first observations of her artistic doctoral thesis. In her work she examines and explores with the possibilities of non-verbal vocality to attune embodied relationality. I am exploring the potential of shared, non-verbal vocal voice to proliferate relational willingness (sensitivity) and aesthetic-ethical vulnerability (sensibility) through the three-part “Hospital Symphonies” series at the Department of Art at Aalto University. 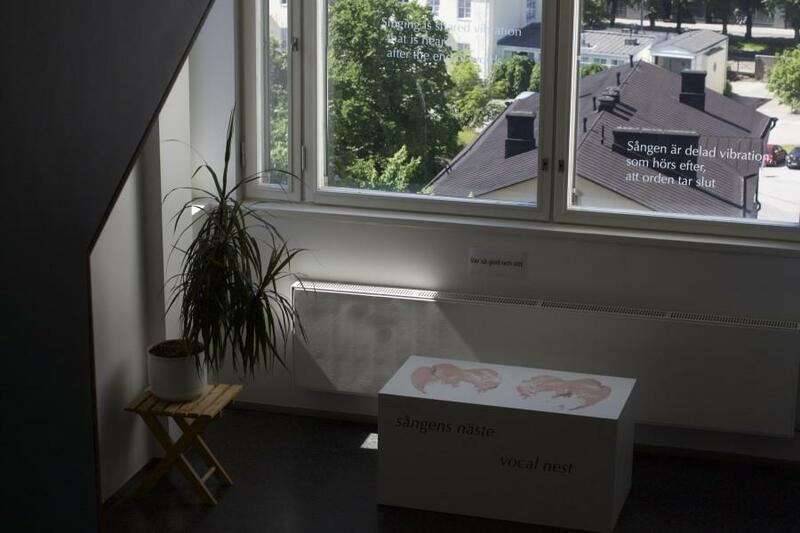 The first part of the series, Vocal Nest (Laulupesä) was implemented in June 2015 in co-operation with HUH Psychiatry Centre of Helsinki University Central Hospital as a site- and situation –sensitive vocal installation to the ten floors high stairwell of the Psychiatrycenter. 25 inpatients, who were being treated in HUH Psychiatry Center in the spring 2014, sing with me in the artwork. The people suffering from psychic loading and the operating environment of a psychiatric hospital orient the research in a specific way. Vocal Nest was an invitation to co-create conditions for sensibility in the midst of hospital life. One of the key aims was to generate, in a hospital space, a new kind of experiential space for patients to express their diversity and vitality: a space for the kind of meaning that does not come, or even cannot come to the sphere of verbal communication. By sensibility I mean a sort of vulnerability: fundamental and active human ability to connect with others and the surrounding reality beyond the scope of verbalisation. The technique is based on a shared vocal voice. With the help of the hospital staff, I invited voluntary patients from four closed wards to join me for one-off open concerts of 30 minutes. I would sing simple vocals and the patients could respond with their own vocals if they were willing to. Most patients joined in. These moments were recorded. The person’s voice will not remain their own, inside them. The voice travels and resonates, touches the flesh and bones, both your own and other’s: hits reality in an unpredictable way. This is why non-verbal vocality can also be striking. The connection emerges through a vocal, embodied encounter rather than words. The first observations confirm my assumption that the power of shared vocality is hidden in an experiential paradox: when you dare to let go and release your voice, whatever it may be – rich or hoarse, psychotic or only a trace – to be a part of the shared voice, this bodily felt resonance field will respond. It rewards you with a new experience of voice, one you may recognise as your own. A subtle change occurs, and this was also audible in the recordings. “What is this?” One patient asked after participating in a recording of the Vocal Nest. “It almost feels as if I have found a new language”. As an artist-researcher, my task is not to “give voice to the patients”, instead, I try to create favourable conditions with my voice and presence to invite the participants to an entirely new dialogue. The role of the researcher is not a distant observer, but experiential in proximity. A common, anonymous vocal matter became the basis of the work. I listened to its tones and sang my own vocalizing afterwards in relation to the patients’ voices. With my voice, I also tuned the work to the key of the lifts in the stairwell of the Psychiatric Centre (a sharp minor). Working together with graduate engineer Thomas Svedström and artist Karolina Kucia, the different layers of voice formed an eight-channel composition in between the nine floors of the stairwell. In Vocal Nest, we made audible, and listened to, something that had not been spoken; it was unknown. What sounded clearest was not illness and suffering, but certain vivacity, perhaps even hope. Some members of staff were, perhaps understandably, worried about the new perspective – intimate, bare, untamed and fragile voices inside a psychiatric hospital. Would they cause anxiety? However, the feedback I received spontaneously from patients, family members, and staff highlighted the feeling of being touched, and many experienced the process and work as moving and thought-provoking. The question of sensibility is connected to an attempt to perceive and verbalise the relational, affective register that is formed in a particular situation. From the perspective of social criticism, it may also make sense to lean on the understandings of the impoverishment of communal sensibility in contemporary society. We live in a socio-political situation that has, according to Franco Berardi (2014) and others, started to influence our ability to connect with the surrounding reality. According to Berardi, this is manifested on nervous, social and affective levels, such as a weakened ability to feel compassion. In my work, I am trying to promote a deeper, slower level of understanding and dialogue of sensibility, and to expand the observations of where sensibility may be decreasing and increasing. In my view, it is impossible to access sensibility without an aesthetic, bodily felt perspective. Here, I am proposing to bring forward the context-sensitive artistic perspective: the attuning possibility of sonorous voice, with its bodily and affective potential to open up radical possibilities for developing new kinds of sensibility. When something happens to people in this field of experiencing and feeling, society is affected. Vocal Nest was preparation for the second stage of my study examining the meaning and effectivity of shared vocal experience, carried out in collaboration with the HUCH Psychiatric Clinic operations. This pilot project is based on art-science collaboration and located where contemporary art, singing and health care meet. For my project, I was approved by the HUS Ethics Committee for gynaecology and obstetrics, paediatrics and psychiatry in June 2014, and was granted the actual HUS research permit in December 2015. The process took several years and required resilience. Its value lies in generating new understanding and aspects of dialogue, also institutionally. The emerging artistic technique is not part of psychiatric care. The work is oriented by aesthetic-ethical values. I invite patients along to this relative field, where shared experiences may emerge, with the trust and faith that they, and perhaps they in particular, have the ability for it. When we evaluate the effects of art on well-being, it is not only a question of what art can give to someone in poor health or living in social exclusion, but a question of what kind of understanding we as a human community are able to generate by tuning with those voices that do not or even cannot enter the scope of verbalisation and cognitive rationalisation. With the experience gained from the Vocal Nest, I would like to suggest, tentatively, that the relational tendency (sensitivity), which is activated on the edges of bodily experience and emotional feeling, and the vulnerability to tune in to non-verbal interactive relations with others and the surroundings (sensibility), may be more intensive for those faced with suffering than for others. This kind of activity can be seen as a form of radical communal participation.